Conservative media have repeatedly asserted that due to ObamaCare (formally the Affordable Care Act), there has been and will be a big shift of workers from full-time to part-time status. Publications such as Forbes, the Wall Street Journal, and of course Fox News, have asserted that this is a fact and a necessary consequence of ObamaCare. The argument is that since ObamaCare will require employers to include health care benefits as part of the wage compensation package to full time employees (defined as those who normally work more than 30 hours a week for the firm), firms will have the incentive, and by competition the necessity, of shifting workers to part-time status. It is argued that instead of employing three workers for 40 hours each (for 120 employee hours), firms will instead employ four part time workers at just below 30 hours each to obtain the 120 employee hours. There are a number of problems with this argument. First, the ObamaCare requirements for health coverage only apply to firms with more than 50 full time employees. There is no change for firms employing fewer than 50 workers. Second, almost all of the firms in the US with more than 50 employees, and indeed a majority also of the workers in firms of fewer than 50 employees, are already in firms that provide health insurance coverage for their workers. Specifically, 97% of the workers in firms with more than 50 employees are in firms offering health insurance coverage as part of their wage compensation package. ObamaCare will require this (to avoid a per worker penalty) to go from 97% to 100%, which is not a big change. And even though ObamaCare will not have such a requirement for firms employing fewer than 50 workers, it is already the case that 53% of the workers in such firms are in firms providing health insurance coverage. Firms provide health insurance coverage as part of the total compensation package they pay their employees both because they have a direct interest in having healthy workers, but also because there are tax and financial advantages to doing so. Notwithstanding these issues, the conservative media and Republican politicians continue to assert that ObamaCare is leading to a large substitution of part-time for full-time workers. But as Jason Furman, the Chairman of the Council of Economic Advisors in the White House has recently noted, this is not seen in the data. The graph at the top of this blog post is one way to look at this data. The graph shows the share of part-time workers (part time for economic reasons and not part time by choice) in all workers, by month, for the period from January 2007 to September 2013. The data come from the Bureau of Labor Statistics. If ObamaCare is leading to a large shift of workers from full-time to part-time status, then this ratio would be rising since ObamaCare was passed or at some more recent date. But it is not. The share of part-time workers in all workers rose in the last year of the Bush administration due to the economic crisis, from about 3% before to about 6 1/2% after. It was rising rapidly as Obama took office, but stabilized soon thereafter as the economy began to stabilize with the passage of Obama’s stimulus package and aggressive actions by the Fed. Since then the ratio has trended downwards, albeit slowly. As has been noted previously in this blog, the continued fiscal drag from government expenditure cuts since 2010 has held back the economy and hence the recovery in the job market. The blog post noted that if government spending had simply been allowed to grow at its long term average rate, we would likely have already returned to full employment (and would have returned to full employment in 2011, if government expenditures had been allowed to rise at the same pace as they had during the Reagan years). The Affordable Care Act was signed by Obama in March 2010. As the graph above indicates, there was no sharp change in trend once that act was signed. If anything, the share of part-time workers in all workers then began to decline from a previous steady level. Such a response is the opposite of what the conservative media and Republican politicians have asserted has been the result of ObamaCare coming into effect. To put the figures in perspective, the graph above also shows how high the ratio of part-time workers to all workers would have had to jump, had either just 5% (the square point) or 10% (the round point) of full-time workers been substituted for by an equal number of part-time workers, additional to where the September 2013 ratio in fact was. An equal number is used between the full-time and part-time workers to be conservative in the estimate. The argument being made by the critics is in fact that a higher number of part-time workers would have been hired to substitute for the full-time workers let go, to get the same number of working hours. But even with an equal number being substituted, such a shift of 5% of the workers would have led to rise in the ratio by 74% relative to where it was in September 2013, and a shift of 10% would have led to a rise of 148%. One does not see anything like this. It is not known what the paths would have been to reach those 5% or 10% shifts, but the resulting changes in the paths would have been obvious. Such changes did not occur. 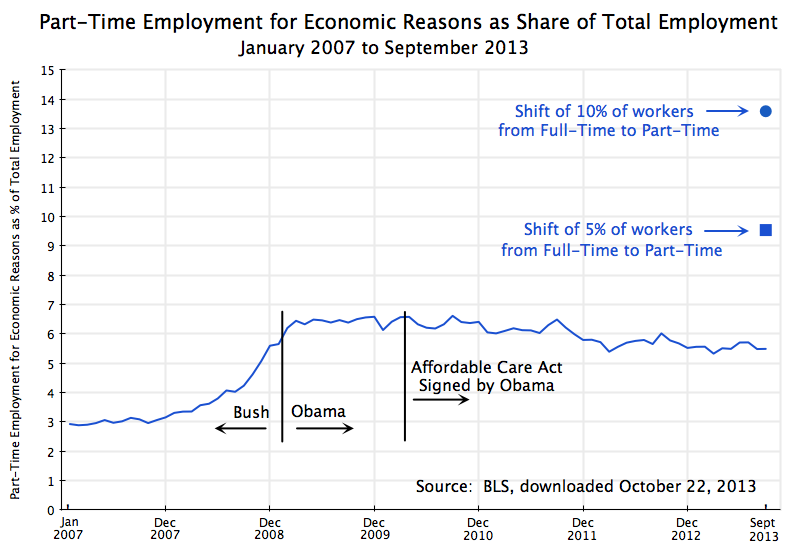 Since one is comparing the figures to what otherwise would have been the case, the conservative critics would need to argue that the ratio of part-time to all workers would have plummeted in the absence of ObamaCare. There is no reason given on why this would have been so. Furthermore, for the case of a 10% shift the number of part-time workers would have had to be negative in the absence of ObamaCare, which is of course impossible. There is simply no evidence to support the assertion in the conservative media that ObamaCare is leading a significant share of firms to shift workers from full-time to part-time status. This entry was posted in Health Reform, Labor and tagged employee compensation, employment growth, health reform, job creation, jobs, policy by aneconomicsense. Bookmark the permalink.